According to AppleInsider, Apple may introduce next-generation iMacs with the newest Intel processors as soon as on Tuesday, May 3. People familiar with the matter told the devices will sport the first-gen Intel Core i processors, new high-speed Thunderbolt port and second-generation Core i chips. Previously it was also rumored new iMacs will get 6000-series AMD Radeon HD Chips and changed display panel size, but this information was not confirmed, neither disproved. In a few days before every major product launch Apple has always made requests to know whether all the operating segments have any problems in rollout. Appleinsider's sources reveal several of those measures were put into place this week and confirm that several Apple retail employees are already making modifications to the product layouts in the company's retail stores. This allows to suggest May, 3 is the most possible day for the release of new devices. 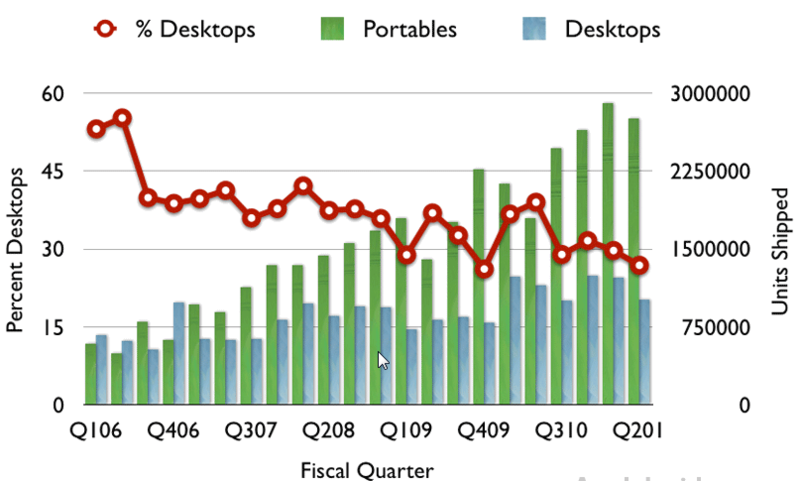 Last time when Apple refreshed its flagship desktop line was more than 9 months ago. 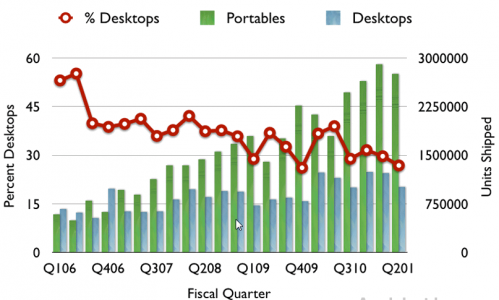 With the success of Apple's iOS devices Mac units saw a significant decline in shipments, which can be seen on the graph above.